The IDEATE (ID8) program empowers students to take charge of their learning and thrive in an ever-changing world. IDEATE is a parallel program to the IB Diploma Programme and offers students voice and choice their final two years of the BCIS Diploma. IDEATE challenges students to pursue their own ideas and transform their learning through meaningful educational pursuits. It is designed to celebrate and develop students’ strengths, talents, and skills in ways that will support any future aspirations. Flexibility within the program allows for a personalized avenue towards post-secondary education and a chance to focus on areas of their choosing. IDEATE will challenge and inspire students to achieve their potential. 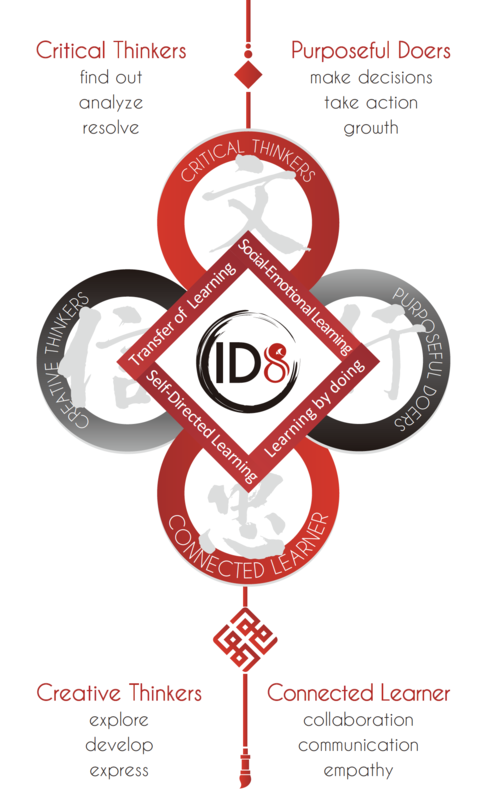 We empower students by developing and demonstrating their skills and dispositions in IDEATE’S Impacts. Social-Emotional Learning: Developing the inter- and intra-personal attributes for successful, happy living. A variety of assessment tools are used such as investigations, portfolios, projects, exhibitions, tests, experience and problem-solving activities. All IDEATE students complete the IDEATE Project Course in grades 11 and 12. The course builds students’ skills, interests and strengths in order to pioneer an entrepreneurial project. Wen Xing Zhong Xin (WXZX) 文行忠信 is the philosophy that highlights what we value as learners at BCIS. Students will curate a collection of portfolio entries to showcase learning and character development. All students are expected to fulfill the requirements for Service Learning and Work Experience. These provide students opportunities to apply their learning in authentic contexts. It is important that families determine the requirements of the Universities of interest with regard to the IDEATE Diploma program as early as possible. As a part of the enrollment and admission process into grade 11, all students will be supported by the University Guidance Counsellor and program coordinators to guide a best-fit approach to completing their High School Diploma and pursuing post secondary opportunities.